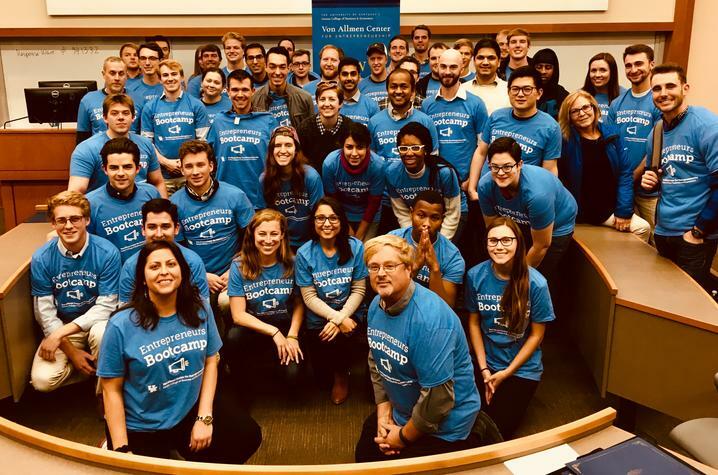 LEXINGTON, Ky. (April 4, 2018) — The Von Allmen Center for Entrepreneurship (VACE), part of the University of Kentucky’s Gatton College of Business and Economics, is preparing for the next edition of its popular Entreprenuers Bootcamp. An information and recruitment session for fall 2018 will be held from 5 to 6 p.m. Monday, April 23, in Woodward Hall, Room 307 in the Gatton College building. The event is free and open to the public. Pizza will be provided. “This information session is open to anyone interested in entrepreneurship, who has an idea, a product they would like to create, or a passion they would like to pursue,” said Warren Nash, executive director of the Von Allmen Center. Bootcamp is a one-semester program created and operated by the center and provides participants a way to experience entrepreneurship in full immersion. All current UK students, faculty, staff, post-doctoral fellows and community entrepreneurs are welcome to participate. The Bootcamp program does not offer academic credit for participation. A certificate of completion is awarded to team members who successfully finish the program. There are opportunities to go beyond Bootcamp and into competitions that offer chances to win prize money and potentially form your start-up. For an idea of the Bootcamp schedule, click here to view the fall 2017 program structure. Click here to RSVP and reserve a spot in Woodward Hall on Monday, April 23.